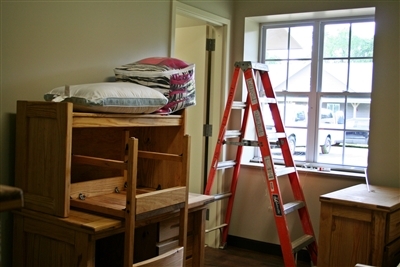 At Madison Youth Ranch, finishing touches are being made to individual children's rooms like the one above. 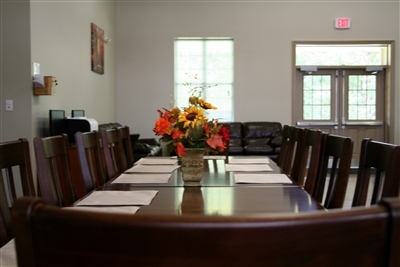 The first children will be welcomed Aug. 1 and will interact in group settings such as the family-style dining table below. Photos by Susan Green. 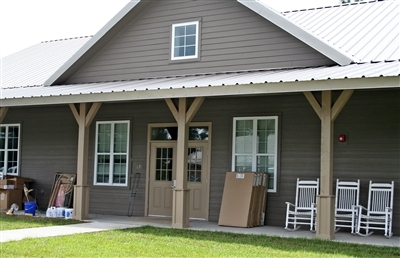 PINETTA – Less than two years after 300 people huddled in the rain to break ground on the Florida United Methodist Children’s Home expansion known as Madison Youth Ranch, the final touches are being put to two large cottages and the house parents are moving in. The new facility for young people in need of a home away from home passed all inspections for licensing last week, said Ruth Moore, administrative services director. The first children are expected to move in Aug. 1. The cottages – one for girls, one for boys – will house 12 youngsters each, and every child will have his or her own bedroom, complete with twin bed, desk and chest of drawers. “We feel like once we open, we will fill quickly,” Moore said. It’s a milestone moment for the Children’s Home, the mother campus of which was founded more than a century ago in Volusia County. The nonprofit institution, founded by Methodists and still largely dependent on United Methodist dollars for its survival, has expanded its outreach through foster family programs and other ministries to the Tampa and Orlando areas. But the new youth ranch is its first residential expansion apart from the original campus. Located only a few miles from the Georgia state line, the ranch generally will accept children from a largely rural area between Tallahassee and Jacksonville, with a southern boundary roughly drawn at Gainesville. The 300-acre former farm site is expected to grow to 500 acres with a pending gift from an estate bequest. Children accepted for residential programs at the Children’s Home often are wards of the state, removed from their family situations because of abuse or neglect, Moore said. Other times, a child may be experiencing emotional problems too great for parents to deal with or the parents may temporarily place a child with the Children’s Home while they recover from a life crisis. Madison Youth Ranch is preparing to open.Guests can tour the site during an opening celebration and dedication service beginning at 10:30 a.m. Tuesday, Sept. 23, at 1647 NE Captain Buie Road, Pinetta. To RSVP or for more information, call (386) 668-5088 or email Madison.Ranch@fumch.org. The ranch is part of the Florida United Methodist Children’s Home near DeLand, which serves about 400 children through various programs in Florida. For information about the Children’s Home, click here. The Children’s Home residential recipe for assistance includes teaching such concepts as manners and courtesy, clean and tidy rooms and basic cooking skills, Moore said. Until a chapel can be built, the children will attend worship at First UMC, Madison, which has an active youth ministry, Moore said. The youth ranch residents will attend nearby public schools, but retired teachers and others with tutoring skills would be welcome as volunteers, Moore said. Children’s Home residents typically have been passed around among relatives or foster homes and have fallen behind in school, she explained. “Through no fault of their own, they probably haven’t been in the same school” for any length of time, Moore said. John Sigafoose, a 30-year veteran of youth ministry, will be lead houseparent, along with his wife, Betsy. He said the expansion site offers great opportunity for the mission at hand. “I can’t wait to get a bike,” Sigafoose said, adding that bicycle riding with young people builds camaraderie. Moore said every child at the ranch will receive a trail bike and safety gear to help them explore the expansive woodsy site as a group activity. Sigafoose said making connections with the First UMC youth group will be important. “I’m really eager to get these kids involved in the youth group … so the local kids can witness to them,” he said. Often positive peer influences make the biggest difference in a young person’s life, he added. 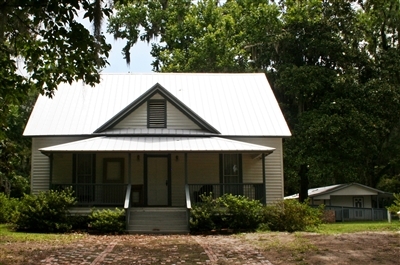 The old homestead of a family farm now serves as offices for Madison Youth Ranch, part of the Florida United Methodist Children's Home. In some ways, the opening of the expansion site has seemed to move quickly, but it was not without hurdles, Moore said. Expansion was part of a strategic plan update in 2008, when the Children’s Home board celebrated the institution’s 100th anniversary, she said. Then in 2011, board members Billy and Dianne Sullivan offered to donate some land in Madison for a group home expansion. Local opposition eventually led the board to a different site. Representatives of the Shirley Barksdale Foundation heard of the effort and began talks about turning over 240 acres Barksdale bought in rural Pinetta to start a program for handicapped children, including an equine therapy component. 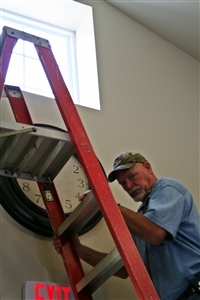 Mike Moore, operations director at Madison Youth Ranch, hangs a clock on the wall of one of the new residential group cottages. The Sullivans donated acreage to provide access to a county road, and another supportive United Methodist couple in Madison, John and Bunny Maultsby, provided a substantial financial gift toward the first group home. Plans include the eventual construction of a stable that will fulfill Barksdale's dream of using horses to reach children in need. Moore said she hopes eventually there will be funding for a swimming pool as well. When Ruth and her husband, Mike, who is operations director, first arrived at the site, there were no paved roads and the only structures were the old homestead, aging outbuildings and some outdoor bathrooms built to facilitate summer camps on the property. There were electricity and well water on site, but no phone or Internet services. The Moores lived in a recreational vehicle for several months while a home was built. They still use the old farmhouse for offices and storage. Each of the residential cottages cost about $1.5 million to build and equip, Ruth said.